An electorate starving for answers to the nation's economic crisis didn't receive much nourishment from the two presidential candidates in their second nationally televised debate. Aside from a new-sounding proposal from John McCain aimed at buying out troubled mortgages, both candidates relied on recitations of their stump speeches mixed with fresh empathy to try and convince voters they are best positioned to take over the reins of an increasingly chaotic and unsettled country. Early indications are that neither were successful in moving voters during their second, highly anticipated, face-off. In an insta-poll conducted by CBS News and Knowledge Networks, Barack Obama had the edge among uncommitted voters who were asked who "won" the debate. But a full 72 percent of those surveyed said they remained uncommitted afterwards, while those who said they decided split about evenly between the two. A draw of that kind is good news for Obama, who has seen the political landscape tilt strongly his way in recent weeks, both nationally and in the crucial battleground states. McCain needs a breakout moment, and he didn't get one in Nashville Tuesday night. What was expected to be a bare-knuckled brawl by some over character issues turned into a mostly issue-oriented exchange. To be sure, there was a fair amount of finger pointing and at least one awkward moment, when McCain referred to his opponent as "that one." And there were a lot of charges and counter-charges, most of which had been heard in the earlier debates or on the campaign trail. Unlike their first debate, McCain seemed more comfortable and less openly irritated to be debating Obama, although Democrats afterwards still described him as erratic and irritable. It was Obama who took some of the hardest jabs at McCain, accusing him of irresponsible rhetoric toward foreign nations and staring intently at the Arizona senator during his answers. McCain's ad-libs and asides fell flat and he was less comfortable than advertised in what was supposed to be his best format, the supposed town-hall. But the candidates threw the pre-agreed time restrictions out the window, despite moderator Tom Brokaw's best efforts to keep them on track. A rough count showed that just 13 questions from the audience or online were asked in a debate that lasted 90 minutes. McCain came off as better prepared on the economic issues than he was in Mississippi just a week and a half ago. But aside from his mortgage proposal, he merely hammered away at the time-tested Republican favorites of low taxes and reduced spending as the way out of the economic morass. Obama spent a good chunk of his time blaming the past eight years of the Bush administration for the economic mess without offering any new thoughts on the solutions. Even when asked directly what kinds of sacrifices they may ask the American people to make in tough economic times, neither could muster much. McCain offered a general call to cut some government programs and Obama urged energy conservation. Obama did criticize President Bush for urging Americans to "shop" in the wake of 9/11, but he failed to mention that he supported last year's economic stimulus package designed to do just that - and has even proposed another, similar one. McCain argued that he could do all of the big things at once, including health care reform and Social Security reform, in the face of the current crisis and massive government rescue of the financial system. Neither candidate made a big gaffe but they took few chances. It was what McCain didn't do that might be the biggest point of discussion in the wake of this debate. His campaign, led by his running mate Sarah Palin, has escalated attacks on Obama over the past several days, specifically for his past association with Weather Underground member William Ayers. It's a page out of the Republican playbook used against Bill Clinton in 1992 to try and use the public's unfamiliarity of the young candidate to raise questions about his overall character. "Who is the real Barack Obama," the candidate himself asked at a rally on Monday. Despite all the talk of taking "the gloves off," though, nothing even approaching William Ayers was raised by McCain, although Obama appeared to be ready for just about anything. The attacks are likely to resume on that front, or some other, as early as Wednesday morning. Time is running short for McCain to buck the prevailing winds that are blowing hard against his campaign. 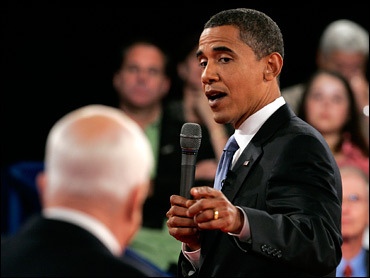 Voters may still have not heard any real answers from the candidates on the economy but all available evidence shows they trust Obama and his party on the issue in general by a wide margin. He's done nothing in two debates to prove unworthy of that trust, and McCain has done little to convince them otherwise.